This is a test of how well students can recognize numbers. They must write numbers in words. Also, they must identify a number expressed in word form. This test has ten problems: seven multiple choice and three drag-and-drop problems. 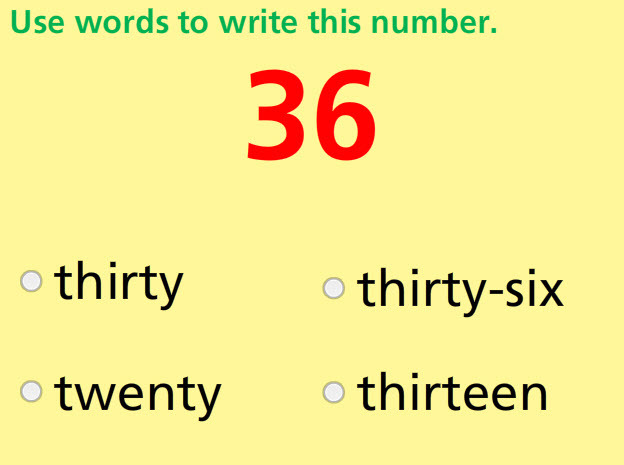 Students must recognize numbers up to 120 in word form as well as in the form of digits. Students can retake the test to show improvement in number recognition. Return from this Write Numbers in Words Math Test to the Elementary Math Tests , 1st Grade Math Tests webpage, or to Math Tests.